Say goodbye to burned pizza and losing time. 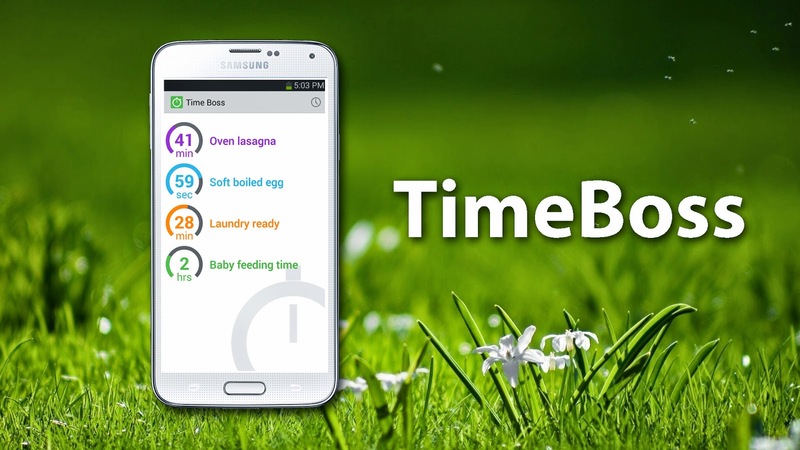 TimeBoss for Android helps you keep your schedule and does it in a surprising simple and effective way. Read the full review. At first I was a little skeptic about installing a timer app. After all, there is an alarm clock already, so who needs a timer anyway. Yet, after trying TimeBoss for a few days, I started to love it. It is easy to use and has some of the best thought out features of any timers out there. Let me tell you why I use this one daily. Another great feature is that you can disable the timer by waving over the camera of your phone (or actually, the proximity sensor, which is mounted next to it). This is just great. When the alarm is ringing, I don’t have to unlock my phone and open the app, I just wave over the camera and it stops. This feature alone is well worth installing the app for. Disabling the alarm by waving is also great for cooking. Say goodbye to dirty screens or pushing flower into the power button. The pro version of the app comes with a widget that shows the value of the lowest timer number and name, which actually turns out to be really neat. It occupies just a single square (1x1) on your screen, talk about great real estate value! During launch (until the end of May 2015) the pro version is only 0.99 USD (0.50 EUR). Kidztime is an iOS lifestyle app that is one of the best parent apps on the App Store. It is the perfect app for keeping all memories of your children while they are little babies. The app will enable you to store different expressions, sayings, events and anything similar. You will be able to do that in a fun, but totally organized and highly functional manner. You can take photo or shoot a videoa with the first words of your baby, or write down the first kind words he said to you. The possibility of Kidztime are basically endless. The app is divided in 3 categories: expressions, memories and stories. In expressions you can store all fun expressions or interpretations of words that your kids create. In memories you can save moments and events that you have experienced with your kids. In stories you can save short stories and quotes from your children. With Kidztime you will never forget the funny sayings or things they are saying. The app has some useful additional features. For example you can share any photo, moment or memory on the social media. You can sync all information with your Dropbox account and keep the data safe and available. Additionally you can create compelling PDF document from within the app and print out the memories of your kids. This app is surely the ideal parent app. You can get it for free for limited time on the App Store. April 21, 2015: SuneX Games, a German based game development company, is all set to release its new Android game, Floorless Fortress, on April 23. The game challenges the player to avoid traps while travelling through a series of rooms. Players need to accumulate fruits along the way within a specified time. The goal, dependent on the chosen game mode, is to survive each room and exit with the collected fruits or in the least amount of time. Bored of endless running through temples, Poppin and Triads ? The home sheep home 2 game has a pack after his bones and needs YOU to guide him through the spooky graveyard in the dead of night to escape them! 23.04.2015. From the developing team of 123-QWERTY LLC there comes the outstanding utility app called 123 QWERTY: Customize Keyboard Keys. With a simple goal to customize your iPhone or iPad keyboards with your preferred and most used phrases, this app tends to save you time and increase productivity. If you use the popular messaging apps every day, 123-QWERTY can be a great partner for you. 123 QWERTY is basically an on-screen keyboard that will enable you to assign different keys. When writing a message, we all need to swipe screens in order to add diferent marks to our messages. Well with 123QWERTY we will avoid such situations, because there will be an extra row of 10 keys that you can fully customize. But, those keys can also be words and phrases. You can easily add greeting, sign offs, signatures etc. With 123 QWERTY: Customize Keyboard Keys you can add rows above the keyboard and customize it according to your needs. With two screens of marks and characters you will avoid the largely annoying changing between screens that can lose you a lot of time. 123 QWERTY shows the number pad on the right side in the landscape mode on the iPhone. This makes the number entry a lot easier and more effective. The same goes with iPad, but there the number pad is available for both Portrait and Landscape. With 123QWERTY: Customized Keyboard Keys you will definitely spend less time swapping screens to write your message. Bring speed and efficiency to your texting and emails. Get 123QWERTY for $0.99 on the App Store. Playinjector is a new game distribution platform made especially for the purpose of supporting game development teams. Frequently this platform is running game bundles and giveaways that not only are beneficial for consumers, but also for game developers. This time Playinjector’s bundle and legacy are: Legacy Games Bundle and the Counter Strike Complete Giveaway. For very affordable prices you can get great games and help the game developers to create even better games. The Legacy Games Bundle consists of 11 fun games split into 3 tiers: Tier 1 - “Legends of Atlantis: Exodus”, “Atlantis: Pearls of the Deep”, “Murder, She Wrote 2”. You can get these games for only $1. Additionally, for beating the average range price the Legacy Games Bundle can be extended with Tier 2 in which you will get “League of Mermaids”, “Criminal Minds” and “Paranormal State: Poison Spring”. Another great attribution is the featured game: “Doctor Who: The adventure games – 5 Episode Bundle”, which you will get, together with the other games, for just $6.49. or more. All these games are created by the high quality developing team of Legacy Games. - It supports the indie developers for creating more awesome, original games! All money directed to Developers will go to the creators of the wonderful games in this bundle. - It helps the research of alternative cancer cures by donating some of your contribution to the AP John Cancer Research Institute. - It takes part in funding future indie games initiatives, by sending some of the money in the Game Starter Fund. - It helps the team of Playinjector to grow and be able to bring more awesome bundles and innovative new services. Only 8 days left for these astonishing deals, don’t miss it. Join the millions of gamers already playing Counter-Strike and enter for a chance to secure your copy today! Playinjector is giving away a Steam key for Counter-Strike Complete, all you have to do is to raise points by simply following the website’s social media profiles. The giveaway is independent from the bundle, but if you purchase one it will bring you extra points and more chances of winning. Bonus: 40% discount on the license. Coupon: TURNS40 (expires on couple of weeks). Spytector is a remote keylogger that will enable you one of the best possible remote surveillance that you can use to spy on your kids, spouse or employees. Basically, Spyector records every keystroke to an encrypted log file - while staying completely undetectable to users. In that way this surveliance tool will enable you to know what certain person is doing on a computer, without their knowledge. Think about it, Spytector can really be a great tool in managing of your employees. You will know which one is truly working or playing around, which is talking bad about you or which one is respecting you. Everything they write on their PC will be recorded with this outstanding keylogger. It works silently in the background, so it will never be discovered. It can’t be tracked neither in Task Manager, nor Add/Remove Programs, Start, Taskbar etc. It also can’t be scanned with the majority of the most popular antiviruses. Regarding monitoring it can record keystrokes, passwords, websites, apps, messaging apps, clipboard, boot events etc. 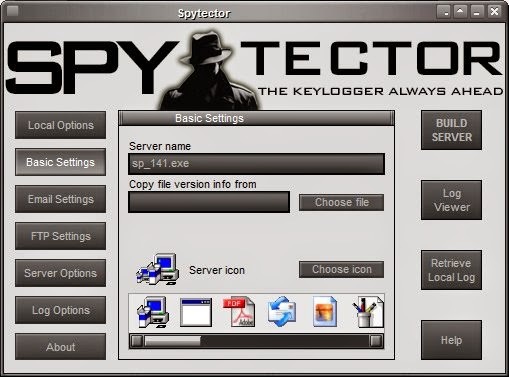 Regarding the keylogger options, Spytector software will enable you remote keylogging, FTP and email log delivery, retrieving passwords from all popular web browsers and messaging apps, option to include URL history in the log, the logs can be stored and edited on server. Also, there is smart keylogging that applies backspace. Regarding interface options the software features lovely built-in Log viewer, option to save settings, logs can be saved as RTF and HTML files, the monitoring features can be set on the main Spytector program and there is also local logfile retrieving. Spytector is compatible with all the Window Operating system and it works on bot 32 bit and 64 bit. It is light, simple and easy to use and this keylogger can be of great use for you in various different situations. It is obvious that this can be extremely useful for management of working environments. With its wide variety of features, Spytector is surely one of the best keyloggers for surveillance and monitoring. It is simple to use, it can monitor the keyboard and the apps, it gives you great options for watching the keylogs and monitoring the activity of the people you want to monitor. uCiC – Request, Receive, Share is a new social networking app that is currently trending on Google Play. It is getting great critical acclaim and the user base is growing rapidly. That is expected because the app is unique, functional and very useful. It will help you into making the best possible decisions. It can give you answers to.. lets say.. which club to go to, or to see if your favorite coffee shop is crowded. All questions and answers are location based and they are given by real users of the app. That is why this app is growing everyday. Tygo - Ball is Life is an iOS sport app that will quickly become one of your favorite apps if you are a basketball fan. This app is obviously created by some talented developers that are die-hard NBA fans. As our office are NBA fans we actually are very thankful for the creators of this app. Tygo will tell you everything you need to know about the NBA, from HD videos, to statistics and scores, you will be amazed with the amount of data it can give you. The app features not only HD videos from YouTube, but there also videos from various other sources, including Vine. There are streams to games and you can comment on any video. The user base is getting bigger each day and you can basically talk NBA for days. Tyga acts like a social networking app as well. That means that you will have a profile and you can share anything you like on the app. Your thoughts of games or just videos you liked, you can really spread your NBA comments to the other users and make impact. Tyga – Ball is Life enables one of the best NBA streams we have ever seen. They with great quality and without ads. All you need to have is a stabile internet connection and you are good to go. As the playoffs are just ahead of us, getting Tyga – Ball is Life on your iOS device would really help you enjoy the game on another level. Many NBA fans are thanking the creators of this app, so are we. That is why we can easily recommend it to anyone, and we are recommending to people we know in real life, as this app is truly great! Get it for free on the App Store. Fantasy Fight is an Android game that is one of the best games in the casual games category. Created with great creativity and talent, Fantasy Fight has quickly become favorite to many Android gamers. It has surely attracted players with its outstanding gameplay, imaginative and creative drawings, colorful HD design, cool characters and interesting game modes. This is one of those games that you simply can’t turn off. One of writers recently tried NuWeb Hosting, and usually, when we experience highly professional service, that is both affordable and quality i.e has value, we always write about it on hightechholic.com. In this review will we try to explain why their services are so highly reliable and helpful. Their website is simple, clean and easy to use. They offer web hosting services, reseller hosting, VPS plans and dedicated servers. You can access any category directly from the homepage. We will concentrate on their webhosting services. They offer 4 hosting plans: Basic, Economy, Economy with free domain and Ultimate Plan. We purchase and use the basic plan, as we needed for a basic website where we only write about gadgets. We got 30GB disk space, 100 GB monthly bandwidth, 5 sub-domains, 20 email accounts and a Control Panel for only $2. This does the job perfectly for us. However if you want to build better and bigger website you will probably need the excellent ultimate plan where you will get everything is unlimited for only $8 a month. As we are experienced in this business, previously we have suffered with many webhosting services where the offers are good, but our sites hosted on those companies were just too slow and not responsive. After using their services for the last month, we can confirm that the site is ultra-fast and responsive, which confirms the quality of their services and company’s reputation. Your web hosting is instant after you pay and you can install any of the popular platforms right away. We used Wordpress and setting up was an easy job. There is also a 30 day money back guarantee, which we obviously never used. The customer support is probably the best we have experienced in a long time. There is live chat and phone support that know their job and are highly responsive. I was especially satisfied with the chat I had with the phone support. They are really helpful and pleasant to talk with. This is how every customer support should be. If you need affordable, highly reliable and quality web hosting services, than NuWeb Hosting is probably one of the best solutions. With their amazing 24/7 customer support you will get both control and safety. Great hosting company, that we recommend to anyone. Integrated Solutions are one of the best web design and digital marketing company that we have ever used. We have used them for hightechholic’s new project and we have largely been impressed by their work, work ethic and talent. So, lets see what they can do best and how can you benefit from their services. First of all we must emphasize that they are group of young and highly talented individuals. They offer full IT service and Digital Marketing services. That means that they cover IT, web design, web development, SEO and paid search. Their IT services cover server installation & maintenance, network design & security, automated data back-up, and remote access services. Also, they can offer great support to business having problems with spyware, virus, printer installation or any other computer problem. You can also use these professional for crafted and modern website design and development. They are experts in that and they have many successful project behind them. Integrated Solutions work with great dedication and they have amazing customer support. We can confirm that as we used their services in February. Their SEO knowledge is also valuable and you can benefit from it. The package with web design and development and the digital marketing is a great solution for small and medium businesses. All you need to do in order to get started is to contact them on the website and you will get an email fast in order to set up the conditions and price. We needed a website for small business. It needed to be stylish, easy to use, responsive and fast. Right at the start they were positive and have given us some interesting advises and proposals. The communication was easy and effective. They delivered everything we asked for in timely manner (around 30 days) and we were extremely satisfied with their service. They have also completed amazing websites for some big clients. It is easy to see that they are a growing and highly professional company that will surely be successful for many years to come. You can see what they offer and contact them on their website. 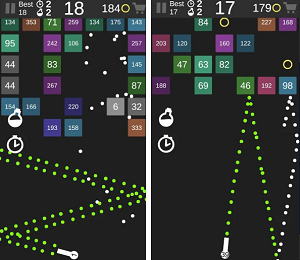 The team of Prihtvi Games released the ultra-interesting casual game called HehPal. It was created with one simple goal, to entertain you to the fullest, but in totally simple way. So, it was no wonder that the moto of the game is as following “No One Can Play Just Once, we Bet!” With the great, easy to understand, tap-and-play game play, HehPal will both relax you and enable you to enjoy pure Android gaming on your smartphone or tablet. This action packed game has amazing graphics, neat design and lovely vivid effects. The game is extremely challenging, so, don’t expect that you will achieve easy and many points. The game can get really confusing and challenging as you progress and it will require incredible skill and technique from you. But what is the game really about? Well, you are a red dot. If you tap on the red dot, it turns to a green square. All the time there are red dots or green squares passing through you. You have to be in the right form so the game won’t stop. For example if a red dot is passing, you won’t need to do anything, but if a green square is passing through you will need to tap and change your shape. As expected, HehPal features various powerups that will enable you to improve your score and help you in the hardest moments. The beginning is easy, but try to prove your mastery when there are many dots and squares coming to you at incredible speed. Remember, same colors will not kill each other, different colors will. Race against time, show your speed and skills and never miss the true color and shape, or you will fail.